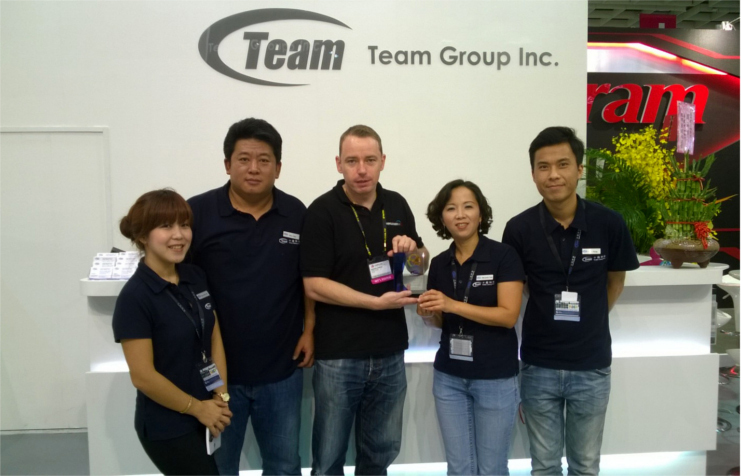 Newcastle-under-Lyme, Overclockers UK has been awarded the Excellent Reseller Award live at Computex 2014, Taiwan, from Team Group LTD memory manufacturer. Team Group were previously an unknown hidden gem to the UK market which Overclockers UK recognised, took grasp and aided growth to ensure recognition especially within the PC gaming market. Now a very popular choice, Team Group offers an incredible array of products in demand along with being the choice for enthusiast overclockers to push their systems to whole new levels. Being presented the award in the photograph. is purchasing manager of Overclockers UK, Andrew Gibson, more well known by his forum name Gibbo.